Before getting into some of last month's trades, let's do a quick recap. My options goals for 2018 is to secure at least $12,000 in options income, a challenging goal representing an increase of about 43% over the amount I secured in 2017. (I consider options income secured if I no longer have any obligations to fulfill). I started 2018 with secured options income of $11,420, so my target for year's end is $23,420. The following snapshot shows the trades I executed in October. You can see all my options trades on a new options page that automatically updates whenever I enter new trades. I haven't had an assignment in a while, and this one hurts a lot! KB Home (KBH) tanked with concerns about a decline in building permits. The stock traded just below $21 on 11 October when the $30 put options got assigned. In essence, this means that I have an unrealized loss of about $2,700 on this position. Compensating somewhat is the $1,492.54 I secured in options income on the trade. On 19 October, Target (TGT) closed at $82.02 per share, about 3% above the $80 strike price of the puts I'd sold. The puts expired and I no longer have the obligation to buy 200 TGT shares. On 19 October, Union Pacific (UNP) closed at $148.70, some 6% above the October $140 put strike price. The put expired and I collected $170.41 in options income. Cisco Systems (CSCO) closed at $45.34 on 19 October, about 13% above the October $40 put strike price. The puts expired and I no longer have an obligation to buy 200 CSCO shares. Travelers (TRV) closed at $126.07 on 19 October, about 10% below the $140 strike price of my covered call. The call expired and I no longer have the obligation to sell 100 TRV shares. AT&T (T) closed at $32.87 on 19 October, about 9% below the $36 calls I'd sold. The call expired and I no longer have the obligation to sell 200 T shares. Finally, Disney (DIS) closed at $118.90, about 5% above the October $125 call strike price. The call expired and I no longer have an obligation to sell 200 DIS shares. I secured options income of $743.77 due to these expirations. McCormick (MKC) closed at $140.65, significantly above the December $115 put strike price. With most of the options income secured, I decided to close the put early and secured $332.55 in options income. On 25 October, Procter & Gamble (PG) closed at $87.86 per share, some 21% above the 17 January 2020, $72.50 put I had sold. With much of the options income secured, I decided to buy back the put, securing $453.29 in options income. AbbVie (ABBV) has taken quite a tumble, closing at $82.96 on 23 October. 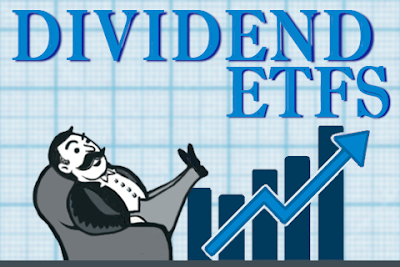 My $100 calls expiring 17 January 2020 were far out of the money, so I decided to secure some of the dividend income by buying back the calls. In all, I secured $4,685.79 in options income with this trade! Finally, on 8 October I decided to trim my position in Qualcomm (QCOM) by 100 shares. To do so, I had to close one of my covered calls on QCOM. With the stock trading at $70.93, I had to dish out more for this option than I initially received, so this one is a loser. The trade cost me $316.29 in options income. Fortunately, selling the 100 QCOM shares earned me a tidy some of money. On 25 October, Gilead Sciences (GILD) closed at $68.62 per share, so my $85 call options expiring in November were deep out of the money. I decided to roll forward the option to January 2019 and simultaneously to lower the strike price to $80. In the process, I added $174.18 in secured options income and $302.84 to my options income tally. On 24 October, Ford (F) closed at $8.18 per share, so my $11 call options were deep out of the money. I decided to lower the call strike price to $10. In the process, I secured $134.94 in options income and added $179.68 to my options income tally. Procter & Gamble (PG) closed at $87.30 on 19 October, some 3% above the $85 call strike price. To protect my shares, I rolled forward the $85 calls to January 2019. The trade cost me $159.80 in secured options income, but I added $694.17 to my options income tally. On 19 October, Nike (NKE) closed at $74.21, so my $75 put option was in the money. I decided to roll forward the option to January 2019 and simultaneously to decrease the strike price to $70. In the process, I secured options income of $91.35 and added $554.16 to my options income tally. Also on 19 October, Ford (F) closed at $8.35 per share, so my $11 call options were deep out of the money. I decided to lower the call strike price to $10 and roll forward to March 2019. 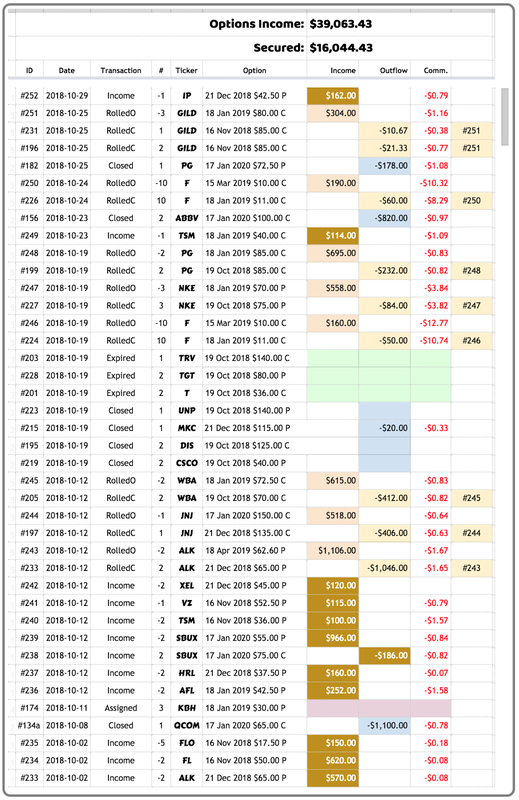 In the process, I secured $144.39 in options income and added $147.23 to my options income tally. With Walgreens Boots Alliance (WBA) trading at $73.50 on 12 October, my 19 October WBA $70 call options were deep in the money, so I decided to roll forward the options to January 2019 and simultaneously to increase the call strike price to $72.50. The trade cost me $125.80 in options income, but I added $614.17 to my options income tally. Johnson & Johnson (JNJ) closed at $133.87 on 12 October, so my $135, December 2018 covered call was near the money. I decided to roll forward the call to January 2020 and simultaneously to increase the strike price to $150. The trade cost me $257.72 in secured options income, but I added $517.36 to my options income tally. Finally, Alaska Air Group (ALK) traded at $61.57 on 12 October, making the $65 puts I sold deep in the money. I decided to roll forward these puts to April 2019, and simultaneously to decrease the strike price to $62.50. The trade cost me $477.73 in secured options income, but I added $1,104.33 to my options income tally. I look forward to expiring options, hopefully allowing me to secure more options income. Of course, for in the money options, I have decisions to make before the expiration date. #234 2018-10-02 : -2 × FL 16 Nov 2018 $50.00 P $ 620.00 ( $ -0.08 ) → In the money by 6% — caution! #225 2018-08-17 : -2 × CMCSA 16 Nov 2018 $37.50 C $ 181.00 ( $ -0.82 ) → In the money by 2% — caution! #214 2018-07-20 : -2 × WSM 16 Nov 2018 $60.00 P $ 717.00 ( $ 0.00 ) → In the money by 1% — caution! #180 2018-05-11 : -3 × GPS 21 Dec 2018 $29.00 P $ 912.00 ( $ 1.45 ) → In the money by 6% — caution! Several options are in the money. I'll have to monitor these carefully as the options expiration dates approach. 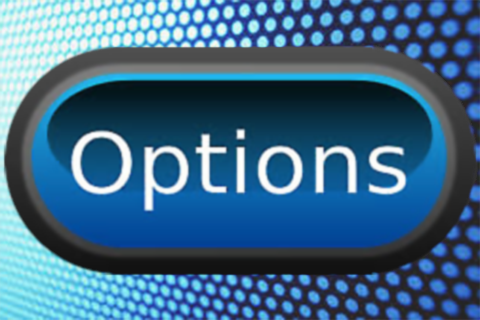 I count secured options income, which is income from options with no further obligations. October was a great month and I'm back in positive territory for 2018! I started 2018 with $11,420 in secured options income. Adding my 2018 goal of making $12,000 in secured options income, the year-end target for secured options income is $23,420.